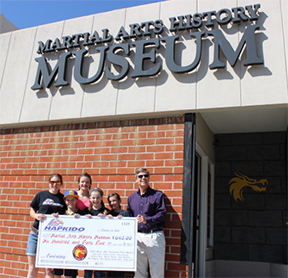 BURBANK, CA – Ten young Karate black belt candidates of American Hapkido: Moorpark's Mixed Martial Arts Training Center, ban together and raise $645 to support the Martial Arts History Museum in Burbank. In order for any of their students to receive their black belt, Dan and Kim Anderson, head instructors of the Moorpark Hapkido school, require their candidates to give back to the community by raising funds for the Martial Arts History Museum. Black belt candidates, which included ten individuals, set a goal of 100 push ups, jumping jacks, crunches and squats as well as self-defense techniques. Black belt candidates this year include Mike Lynch, Graeme Jackson, Erica Hartman, McKenna Smith, Sabrina Kievman, Emily Middleton, Sam Maggiora, Kyle Kievman, Ecksley Smith and Ishaan Joshi. For more information about the Martial Arts History Museum, please visit www.Mamuseum.com or call (818) 478-1722. The Museum is located at 2319 W. Magnolia Blvd., Burbank, CA 91506.